Background: α-Synuclein (αS) is the precursor protein present in Lewy Bodies that helps in the formation of highly ordered amyloid fibrils that is associated with the occurrence of Parkinson’s disease, a neuro-degenerative disorder. Many reports have now been focused on finding the probable targets to weaken this debilitating disease. Recently γ-synuclein (γS), a presynaptic protein, was highlighted to inhibit the aggregation propensity of αS both in vivo and in vitro. However the nature, location and specificity of molecular interactions existing between the αS and γS is not known in spite of the potential importance of γS as an inhibitor of αS. Objective: To understand the inhibition of αS aggregation by γS at the molecular level. Methods: Umbrella sampling method was used along with molecular dynamics simulation to investigate the conformational dynamics, degree of association and molecular interaction between the monomeric units in the αS/γS hetero-dimer. Results and Discussion: The dissociation energy barrier for αS/γS hetero-dimer was found to be higher than αS/αS homo-dimer. αS can therefore readily form a hetero-dimer by combining with γS than forming a homo-dimer. We also observed strong transient interactions involving hydrogen bonds, salt-bridges and non-bonded contacts between the monomeric units in αS/γS hetero-dimer. 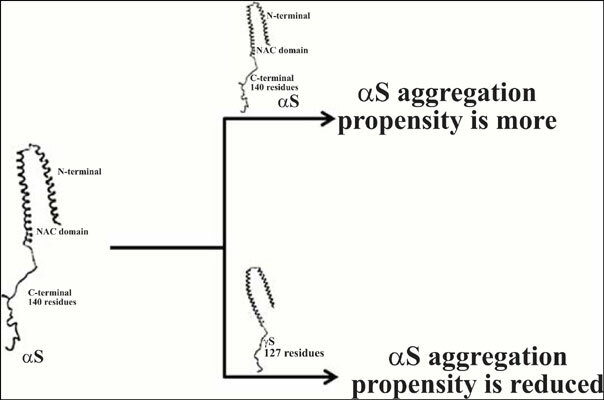 Conclusion: Our findings suggest that γS may inhibit the aggregation propensity of αS. Lewy bodies, molecular dynamics, parkinson's disease, potential of mean force, self-assembly, homo-dimer.